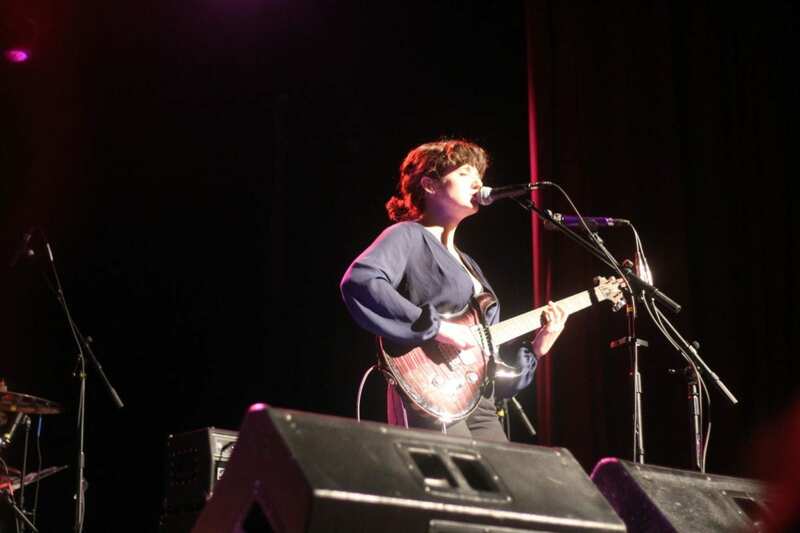 It was a “Stormy Monday” for the blues inside the prestigious Cohoes Music Hall on April 16. 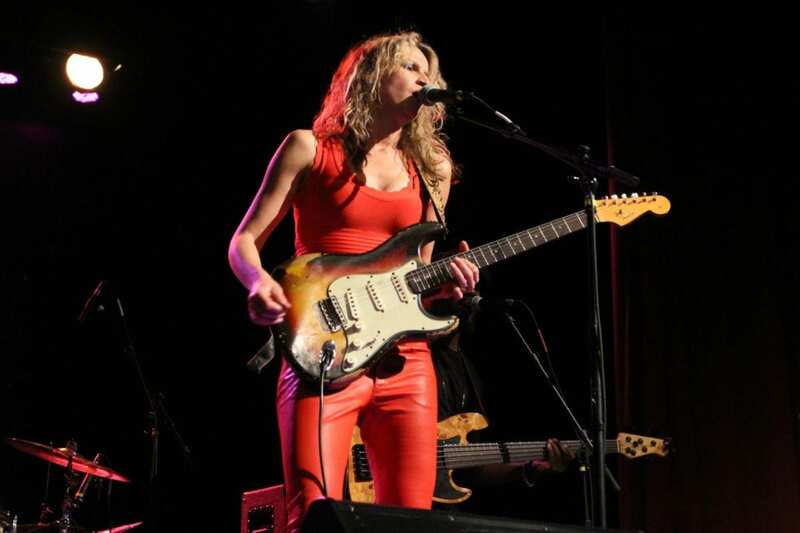 The heavy rain didn’t put a damper on the blues fans that had stepped inside the music hall on a Monday evening to escape from the everyday stresses of daily life for a worry-free, entertaining evening of music from both Girl Blue and Serbian-Blues guitarist and vocalist, Ana Popovic. Almost a full year since her last performance at the music hall, this time around, Popovic pulled out all of the stops as she continued to dazzle the audience with her electrifying guitar solos, captivating vocals, and a stunning cast of performers within her five piece ensemble that had joined her for her tour to promote her new three disk album Trilogy. Popovic’s rhythm and horn ensemble were tight and in full swing throughout the entire evening. Her rhythm section begun the evening with an instrumental of their own rendition of “Ana’s Shuffle” from the album Can You Stand The Heat. They continued to jam along to the tune before Popovic, dressed in the similar red tank top, jeans, and heels that was previously worn at last year’s concert, joined the band on stage to play some solos on her guitar before moving on to perform a series of her songs from Trilogy. “It’s great to be back!” called out Popovic to the audience as she had begun her song, “Can You Stand the Heat”, from her previous album. Song after song, Popovic and her ensemble were outstanding, never outshining each other as they performed their own riffs, rhythms, and solos for each song. Popovic took the time to introduce the City of Cohoes to her full ensemble before performing “Train” from Trilogy: Disk #1 (Morning) to a happy audience that was excited to also hear Popovic’s drummer, Cedric Goodman, play some riffs on the drums that got them dancing and moving in their seats. “Long Road Down” brought her listeners back in time to the times of being on the Oregon Trail while focusing on Popovic’s extensive travels as she had continued on her journey to further pursue music as she had moved from her origins of Belgrade, Serbia, to Amsterdam, Holland, Memphis, Tennessee, and settled in Los Angeles, California where she has currently resided for the past two years. Popovic is able to smoothly transition well from performing lead to slide guitar as she continued to play slide on “If Tomorrow Was Today.” Following suit to her empowering gym-based workout song, “Show How Strong You Are,” each of her key players in her ensemble rose to the occasion and performed their energetic, emotionally-felt awakening solos, from the jazz-lead bass playing of the bassist, back to Popovic, to the drummer, and on towards the other performers to close out their main set. The blues wasn’t exactly going to end completely from Popovic and her ensemble. The band returned to the stage for their encore as they concluded the evening with a cover of Popovic’s “Mo’ Better Love,” and closing out the event with a cover of a song that she had discovered recently before she began recording Trilogy, “Fence Walk” from the Brooklyn, NY based band, Mandrill. Popovic’s interaction with both the crowd and with her own band members is both electric and entertaining to watch. Moving from side to side, Popovic joined in on the jam between her horn players, Jon Ramm (trombone) and Brad Walker (saxophone), on the right side of the stage as they had gathered around each other, creating a musical dialogue heard within their notes and soloing while closing out the evening. Popovic left the stage, leaving the remainder of the ensemble to continue to jam to the tune and close out the funky number on a high note that satisfied both the band and the audience. Albany based act, Girl Blue, featuring vocalist and guitarist, Arielle O’Keefe, opened up for Ana Popovic and her band. Playing a set of eight original songs, O’Keefe did a great job performing solo to her tunes that were mixed in with her own vocals being recorded on a loop. My first time hearing O’Keefe perform live, the sound of her voice reminded me of a mix between Norah Jones, Regina Spector, Alanis Morrisette, and Katy Perry, as she had sung her own unique, original tunes that related back to teenage and early adult moments of angst, drinking, and other fun, significant moments within her life.